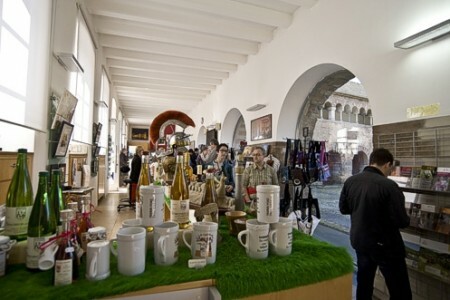 We - the Tourist Information Trier - look forward to giving you advice and practical assistance in planning your trip to Trier. We will be pleased to help you organize and plan your holiday or excursions in the holiday region of Trier and environment. 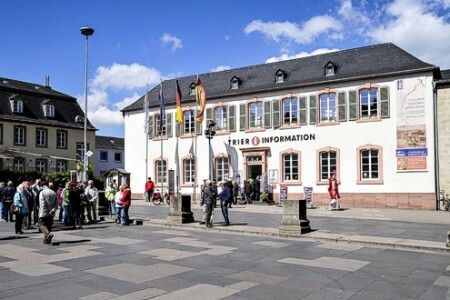 You can find the Tourist Information in the city center right next to the Porta Nigra. Here you will find useful advice and up-to-date tips for a wonderful stay in Germany's oldest city as well as in the Holiday Region Trier. 04/21/2019: 10:00 a.m. - 5:00 p.m.
04/22/2019: 10:00 a.m. - 5:00 p.m.
04/23/2019: 09:00 a.m. - 6:00 p.m.
04/24/2019: 09:00 a.m. - 6:00 p.m.
04/25/2019: 09:00 a.m. - 6:00 p.m.
04/26/2019: 09:00 a.m. - 6:00 p.m.
04/27/2019: 09:00 a.m. - 6:00 p.m.
04/29/2019: 09:00 a.m. - 6:00 p.m.
04/30/2019: 09:00 a.m. - 6:00 p.m.
05/01/2019: 10:00 a.m. - 5:00 p.m.
05/02/2019: 09:00 a.m. - 6:00 p.m.
05/03/2019: 09:00 a.m. - 6:00 p.m.
05/04/2019: 09:00 a.m. - 6:00 p.m.
05/06/2019: 09:00 a.m. - 6:00 p.m.
05/07/2019: 09:00 a.m. - 6:00 p.m.
05/08/2019: 09:00 a.m. - 6:00 p.m.
05/09/2019: 09:00 a.m. - 6:00 p.m.
05/10/2019: 09:00 a.m. - 6:00 p.m.
05/11/2019: 09:00 a.m. - 6:00 p.m.
05/13/2019: 09:00 a.m. - 6:00 p.m.
05/14/2019: 09:00 a.m. - 6:00 p.m.
05/15/2019: 09:00 a.m. - 6:00 p.m.
05/16/2019: 09:00 a.m. - 6:00 p.m.
05/17/2019: 09:00 a.m. - 6:00 p.m.
05/18/2019: 09:00 a.m. - 6:00 p.m.
05/20/2019: 09:00 a.m. - 6:00 p.m.
05/21/2019: 09:00 a.m. - 6:00 p.m.
05/22/2019: 09:00 a.m. - 6:00 p.m.
05/23/2019: 09:00 a.m. - 6:00 p.m.
05/24/2019: 09:00 a.m. - 6:00 p.m.
05/25/2019: 09:00 a.m. - 6:00 p.m.
05/27/2019: 09:00 a.m. - 6:00 p.m.
05/28/2019: 09:00 a.m. - 6:00 p.m.
05/29/2019: 09:00 a.m. - 6:00 p.m.
05/30/2019: 10:00 a.m. - 5:00 p.m.
05/31/2019: 09:00 a.m. - 6:00 p.m.
06/01/2019: 09:00 a.m. - 6:00 p.m.
06/03/2019: 09:00 a.m. - 6:00 p.m.
06/04/2019: 09:00 a.m. - 6:00 p.m.
06/05/2019: 09:00 a.m. - 6:00 p.m.
06/06/2019: 09:00 a.m. - 6:00 p.m.
06/07/2019: 09:00 a.m. - 6:00 p.m.
06/08/2019: 09:00 a.m. - 6:00 p.m.